Alasinga Perumal (1865-1909) was a disciple of Swami Vivekananda. 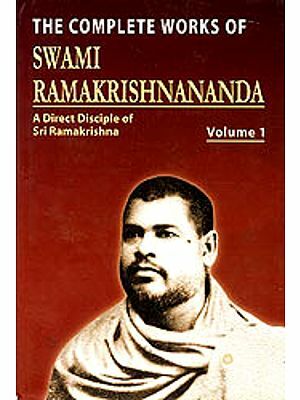 He played a pivotal role in Swamiji’s going to the West and also helped materialize many of Swami’s ideas regarding starting of Ramakrishna Movement in India. Hailing from an orthodox background, he was born in Chikkamagalur in Karnataka and later, after many ups and downs in life, shifted to Madras where he taught in a college. He met Swamiji in 1982 when the latter visited Madras as a wandering monk. 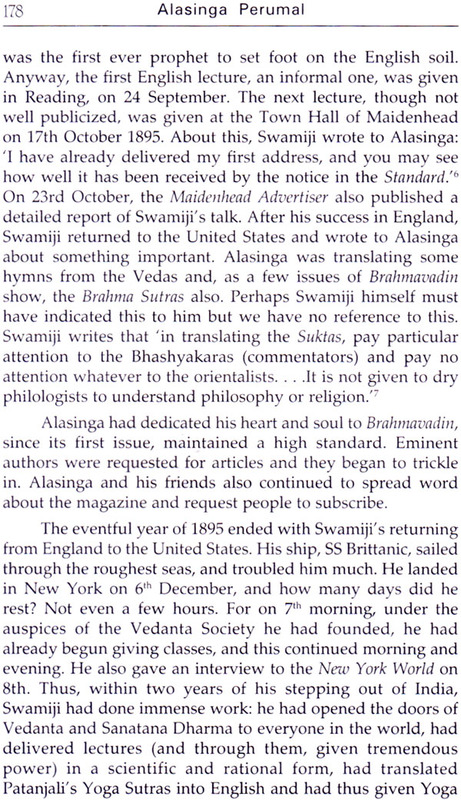 Swamiji addressed many of his letters to Alasinga and had much appreciation for Alasinga’s selfless and pure character. Here is the story of an extraordinary individual whose legendry dedication and commitment, and devotion to his Guru are an everlasting source of inspiration and strength. The students of Swami Vivekananda’s life are familiar with Alasinga Perumal. But what most do not know is who Alasinga Perumal was—except that he was a devout Vaishnava from Madras and an ardent devotee of Swami Vivekananda. Though there is a book in Kannada (with an English translation) titled Karma Yogi Alasinga Perumal by LN Shastri, published from Ramakrishna Ashrama, Mysore, this present volume attempts to present his biography from a slightly different angle. With judicious borrowings from the Kannada book, and drawing heavily from publications such as the Life of Swami Vivekananda by Eastern and Western Disciples, Letters of Swami Vivekananda, Reminiscences of Swami Vivekananda, Swami Vivekananda in the West: New Discoveries, and a number of other authentic sources (including many websites), this volume is an earnest attempt to portray Alasinga’s life and personality for English knowing readers. Here is a life-sketch of an extraordinary individual who played a pivotal role in Swami Vivekananda’s visit to the West and his subsequent participation in the first World Parliament of Religions held in Chicago in 1893. Alasinga Perumal met Swamiji in 1892 at Madras where Swamiji had come as a wandering monk. Their meeting soon grew into deep mutual appreciation and the result was a lifelong association. While Alasinga was deeply impressed with Swamiji’s profound spirituality, original thinking and charming personality, Swamiji greatly admired Alasinga’s dedication, unselfishness, service and enthusiasm for carry- ing out whatever he asked him to do. No wonder, Swamiji wrote extensively to Alasinga and these letters to Alasinga are now part of Swamiji’s Complete Works. A biography of this illustrious disciple-friend of Swamiji was long overdue. We are grateful to Swami Sunirmalananda, former editor of Prabuddha Bharata, a monthly journal published by Advaita Ashrama, Mayavati, for the ardous task of collecting all the relevant facts and for writing this book. We are sure it will add a great deal to our understanding of how Alasinga and other ‘Madrasi friends of Swamiji’ contributed to the divine mission of Ramakrishna-Vivekananda. Our thanks to the Sri Alasinga Perumal (Jr.), the octogenarian grandson of Alasinga Perumal from Bangalore, for his help in correcting and authenticating many facts given in this book as also for providing some of the material and photographs included in the book. We are grateful for the subsidy he provided for the publication of this book. We are also thankful to four other devotees and admirers of Swamiji who have substantially contributed towards subsidizing the book. We have also included some 43 letters of Swami Vivekananda to Alasinga Perumal from the nine-volume Complete Works of Swami Vivekananda, published by the Advaita Ashrama, Kolkata. A letter to Alasinga written by Lokamaya Balagangadhar Tilak, well-known freedom fighter and a tribute to Alasinga by Subrahmanya Bharati, the great Tamil poet and freedom fighter, have also been included in the Appendix. A number of photographs of people and places mentioned in the book have been added in order to enhance its presentation. Our thanks to Swami Atmashraddhananda, editor of The Vedanta Kesari, the English monthly brought out by this Math, and the team of volunteers who, as a labour of love, went through the manuscript and made significant contributions towards giving present shapes to this book. 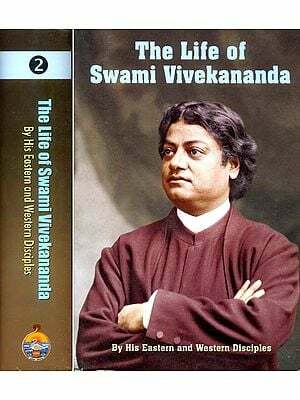 We are glad to publish this volume on the happy occasion of 150th Birth Anniversary of Swami Vivekananda (1863-2013) being observed now. The ideal that india has preached since time immemorial is the attainment of Supreme Knowledge through service and sacrifice. Whether one is a householder or a monastic, the goal is the same: to know the Truth or God through any of the various means called yogas, but fundamentally to lead a life of self sacrifice and service to other. The Householder, especially had to take care of and provide for the other three groups: the student, the retired person, and the Monk. So his responsibility in the scheme of life was greater. Alasinga Perumal lived such a life. Swami Vivekananda's words about his dear disciple sums it all: One rarely finds men like our Alasinga in this world-One so unselfish, so hard-working, and devoted to his guru, and such an obedient disciple is indeed very rare on earth. Alasinga dedicated his life for the service of his guru Swami Vivekananda and for the good of other. He hardly cared for his own family; to him dharma was everything. He was a school teacher initially, but rose to become a renowned journalist and editor. Yet he remained a humble unassuming person always ready to be of service to other. He never mentioned his name anywhere in the editorials or articles he worte. Only recently,a few booklets have been written about Alasinga Perumal. It is therefore difficult to Provide a Comprehensive biography of his great soul; he was always hidden. Yet, from whatever information is available we have placed beofe the readers the life of an individual who was instrumental in the spreading of Vedanta globally.